Laughing Whitefish Falls is in the Laughing Whitefish Scenic Site. 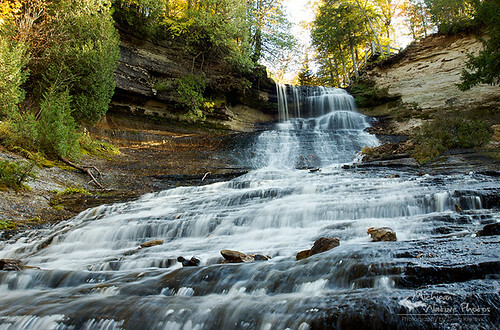 This is one of the most impressive of Michigan’s waterfalls. I believe it is the highest waterfall in Michigan that is readily visitable. The waterfall is a long slide. It looks bigger in person than in the pictures. That may be a result of having to walk down all those stairs to get to the bottom. I was first there on a rainy day in May when there was a lot of water flowing. I have seen pictures of the falls with even more water flowing. In drier weather the water may spread so thinly across the rocks to be hardly visible. On my second visit it was sunny. The brightness of the falls makes it hard to photograph. The waterfall is named for the river. The river is so named because the mouth of the river resembled a laughing fish when viewed by the Ojibwe from Lake Superior. Head over to GoWaterfalling for detailed directions and other nearby waterfalls. Check this out bigger and see more in Greg’s Upper Peninsula of Michigan slideshow. Also check out this cool slideshow from Laughing Whitefish Falls in the Absolute Michigan pool on Flickr! So many great waterfalls in your state.